Also known as “golden needles” and “tiger lilies,” dried lily buds are among the most notable of edible flowers in Chinese cuisine. Lily buds are the unopened flowers of the daylily plant. The lily, or Hemerocallis to refer to it by its scientific name, has been used in China as both a food and medicinal plant for over 2,000 years. 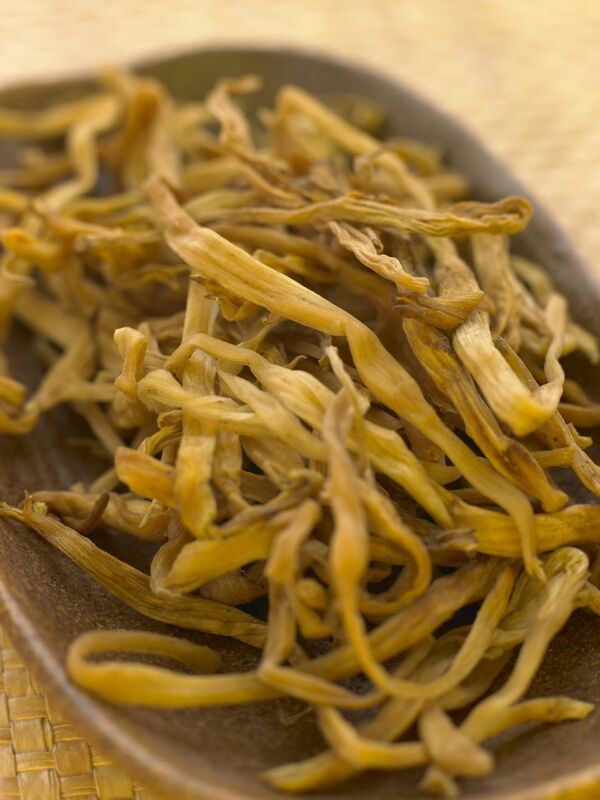 In traditional Chinese medicine, dried lily buds are thought to help with insomnia and alleviate a cough. Dried lily buds are typically yellow-gold in color and are generally two to three inches long. They are known to have a delicate flavor, often described as musky, earthy, and sometimes even sweet or slightly tart. More often than not, dried lily buds are used for their unique aroma which is somewhat fruity and flowery. When used in recipes, they generally have a chewy, but slightly crunchy texture. Dried lily buds can be found in most Asian markets and are generally available in small four-to eight-ounce cellophane bags; they are relatively inexpensive. When purchasing dried lily buds, look for ones that are pale in color and not brittle—freshly dried lily buds should be light brown in color and flexible. If they are dark brown or they crumble, don’t buy them as they are past their prime. At home, store dried lily buds in a sealed jar in a dark and cool and dry place. Before using, you may need to cut off about 1/4 inch at the bottom of the bud to get rid of the woody stem. As the buds are most often purchased dried, like many other "woody" Chinese vegetables and ingredients, they need to be rehydrated in water before using. Soaking the lily buds in warm water (in this case, for about 30 minutes) before using will do the trick. They can then be left whole or cut in half crosswise as called for in the recipe. Some recipes even call for the buds to be cut in half and hand shredded. For better flavor and an interesting texture, try tying them in a knot. Dried lily buds are an ingredient in many authentic Chinese recipes both as a vegetable of sorts and as a garnish. One of the most famous lily bud dishes is “Jai,” otherwise known as “Buddha’s delight," which is a vegetarian stew traditionally served on the first day of the Chinese New Year to bring good luck. Other well-known Chinese dishes that prominently feature lily buds are Mu-Shu pork, an egg, pork, and vegetable stir-fry wrapped in a pancake, and the classic hot and sour soup.